The Nexys 4 has an onboard USB host connector with a microcontroller that sits between it and the FPGA. The microcontroller will handle the USB HID protocol and emultates PS/2 bus signals. There will be no need for an external PS/2 to USB converter at all. This section of the Nexys 4 reference manual has details regarding the keyboard connection. The section before it gives details to the HID controller. I hope this information helps you. Do not hesitate to ask any questions you may have, and I will do what I can to help. Could you please send a quote of the Vivado error or a screenshot of it? Without seeing the error I would guess that you need an equivalent library statement to make the library that your custom package resides in visible. If that is the case when you get back to me, I will give you the details on how to create your own library using the Vivado tools. If you are not interested in writing to the PS2 port (as I needed to do to get the mouse working), I suppose you might not need these lines, allowing instead the two port lines to be complete inputs. However, in my XDC file, I declare that each of these pins has a pull up on the line. Without that pull up, it is possible that the slave might wait forever for the clock line to go high--making all of your communication impossible. Further, looking at your shift register implementation, I would *highly* discourage you from looking for clock events on anything but clock lines. I think you will find some very difficult timing problems going that road. Indeed, I would suggest that, within your designs, you use as few clocks as possible, and that *every* switch from one clock domain (positive edge of one clock) to another (positive edge of another clock, or even negative edge of the first) be very carefully engineered to avoid any metastability issues. 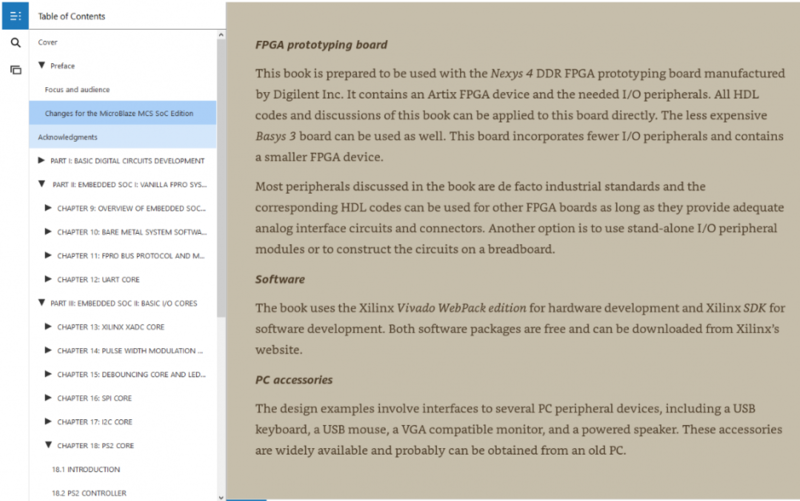 I would suggest reading the book FPGA Prototyping by SystemVerilog Examples: Xilinx MicroBlaze MCS SoC Edition by Pong Chu. It is his latest (2018) addition to his book series and uses the Nexys 4 DDR. He develops a PS/2 keyboard core in chapter 18. He also has a VHDL edition. Here is Digilent's Verilog Nexys 4 DDR keyboard project and here is a link to the GitHub for the project which has source files. Thank you sir ,(FPGA Prototyping by SystemVerilog Examples: Xilinx MicroBlaze MCS SoC Edition by Pong Chu.) how to get a solutional manual for this book. but we want to implement on monitor using vga synchronization. could you please provide a source code for the keyboard interfacing using nexys4 board and vga synchronization sir. There is a companion website for Pong Chu's books here. You can find the source code from the book there. Part IV of the book covers video systems and the VGA interface. thank you sir, but in this book they use spartan3 board for keybord interfacing that is not working on the nexys4 board.. The latest edition FPGA Prototyping by SystemVerilog Examples: Xilinx MicroBlaze MCS SoC Edition 2nd Edition (ISBN-13: 978-1119282662) uses a Nexys4. The companion website is here. Here is a snip of the preface where it specifies the board and the table of contents that shows chapter 18 where he develops the PS2 core.